Home » Flavours Blog » Flavours takes on the Caledonian Challenge! Flavours takes on the Caledonian Challenge! 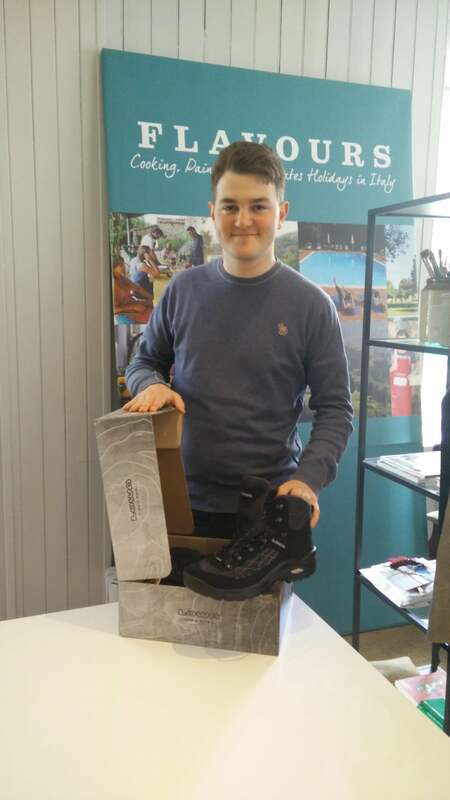 From Italy to the Highlands – with only 15 days to go, our Edinburgh office team are getting ready to walk the 24 mile Caledonian Challenge on June 13th! Our team of four will start in Glen Nevis, near Fort William under the name “24 Miles to Victory” and tackle the hills south along the West Highland Way towards Kinlochleven. From there, the going gets tough as they climb the Devils Staircase and return down to finish at the Mountain Centre. The walk challenges participants to complete the 24 mile route within 12 hours, in aid of charity Foundation Scotland. The Foundation provides a source of funding to community projects across the country. Our Flavours team have been doing a bit of training and are still fundraising towards their target of £1200. If you think you can help please follow the link to donate here. Picture: Team member Kieran is ready for the challenge. He’s got 15 days to walk in those new boots!